Glitter Glam Online Shopping With Fashion Promo Code! You are here:Home » Promotion / Events » Glitter Glam Online Shopping With Fashion Promo Code! Glitter Glam, a home-grown brand that serves a clientele of ladies, tasteful and contemporary in her wardrobe selection. Do you know that Glitter Glam is one of the favourable wardrobe sponsor brands for Singapore's TV station and various production houses? Aren't you impressed? I like outfits with simple designs, but yet command attention. I'm glad I was able to pick up some pretty pieces at Glitter Glam during my recent visit to their outlet at Isetan Wisma. 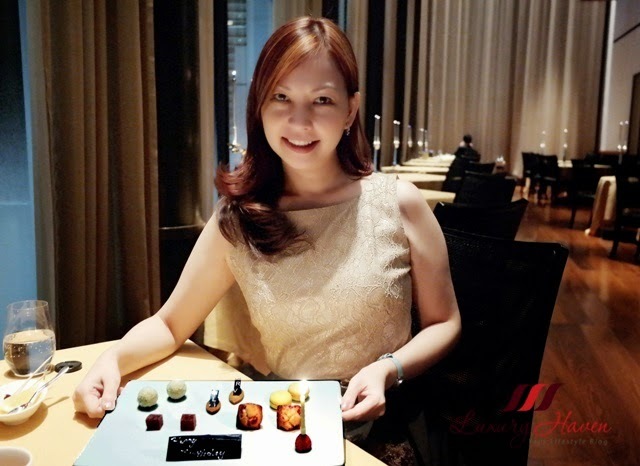 I had couple of media events in Malaysia and Japan last month to review some hotels and restaurants, and I took my Glitter Glam outfits with me. I'm in love with these beautiful pieces and had received several compliments especially when I was in Tokyo. Check it out! My family had a 4D3N getaway at DoubleTree JB, and celebrated our 24th Wedding Anniversary there. The hotel room is gorgeous, isn't it? We had a lovely surprise when we opened our room door - rose petals were raining all over the room! Not only the hotel filled our room with roses, we also found a pair of stunning swans made from bathroom towels! #LBD is a must-have is every gal's wardrobe! Glitter Glam's Little Black Dress was a perfect fit for our special occasion. Since Tosca is located within the hotel, I didn't want an outfit that's too lavish. It's simplicity at its best with Glitter Glam's Black Jacquard Dress! The lace top adds an extra touch to the simple dress of Cotton and Poly mix. 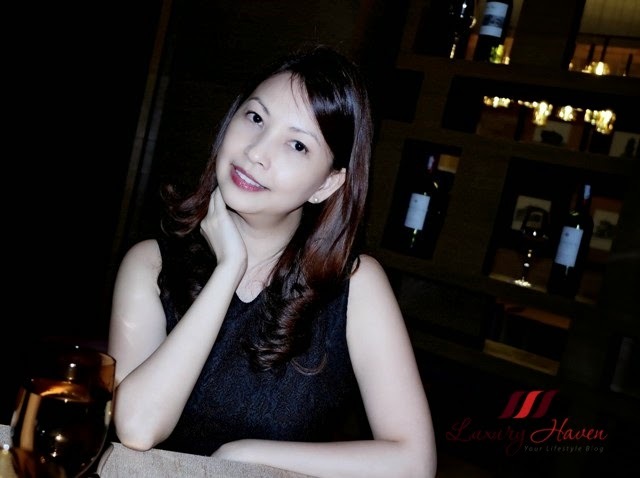 The dress also provided a warm and graceful touch to the romantic ambience in the room and the Italian Restaurant. Do you have a #LBD in your wardrobe too? I like the fact that the Glitter Glam Leigh Top with Puppy Print comes with a separate satin ribbon, making it so versatile to wear the top. What do you think of this cute puppy print top? Which style do you prefer? If you've been to Malaysia, you'll know that the weather there is scorching hot. I'm so glad I brought along this Glitter Glam Leigh Top with Puppy Print. The fabric, made from Cotton and Polyester, is light and cooling, just perfect on a hot day! Don't you just love the combination of gold shimmer and classy black of this Corded Lace and Polyester dress? 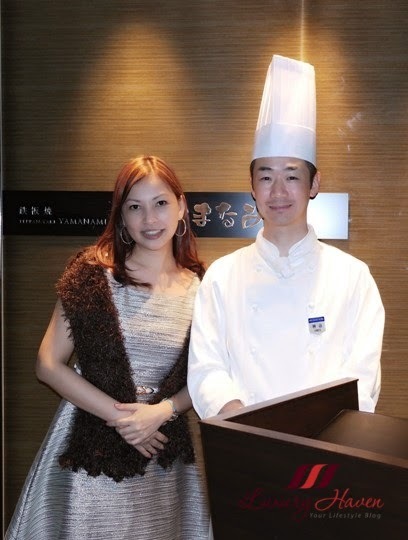 It was an advanced birthday celebration for me in Tokyo, and I was certainly pleased to fine dine at the Michelin-starred Bvlgari Il Ristorante. You may think it's crazy to go out there at 18°C in a sleeveless dress and without any stockings, but my fur shawl provided me with some warmth besides giving a touch of sophistication to the Gold Corded Lace Dress. Gold may be a loud colour, but the clever use of a subtle gold lacy top is modest seduction without overpowering the dress. I love accessorizing the dress with the Glitter Glam Chain Loop Belt at SGD $19.90. Featuring a gold chain buckle, the belt comes in black and red colour. 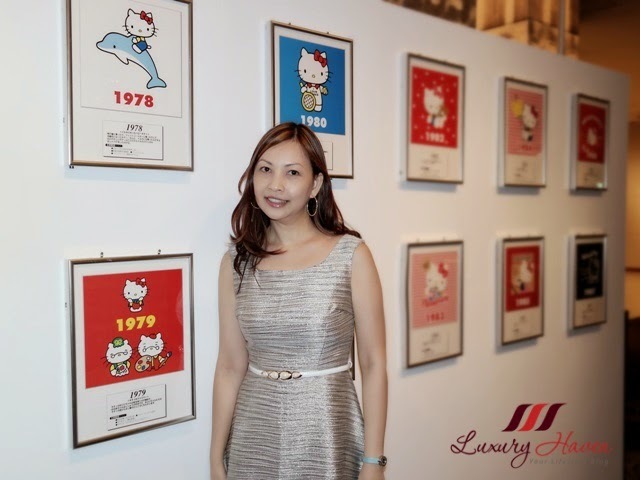 It was certainly an honour to be the only International Blogger, and to be the 1st to stay in Keio Plaza Hotel's Hello Kitty Rooms in Tokyo to celebrate the Hello Kitty 40th Anniversary! Certainly such an event calls for a glamorous outfit like the Glitter Glam Metallic Tweed Dress? Made from Polyester, it's tweed goes charismatic with an elegant silver metallic makeover! I love all the glitters and compliments pouring in; the dress certainly caught a lot of attention! I'm so happy to be able to celebrate my birthday in Tokyo at the Polestar Sky Bar with my favourite Hello Kitty character. Only difference, she's 40 and I'm 49, and #hellokitty still looks so cute and adorable! Lol! For a girly gorgeous look, accessorize with the Glitter Glam Marble Droplets Belt at SGD 19.90. Two colours to pick from, black and white. So, what do you think of my Glitter Glam picks? Which do you like most? Glitter Glam is characterized by a work wear collection with an edgy character, yet accomplishing great comfort and excellent fit at the same time. I thought prices at Glitter Glam are rather affordable considering the quality of the outfits. Shopping in Singapore isn't cheap these days; a simple dress can easily cost you over a hundred. Over at Glitter Glam, you can find lots of ladies wear below SGD 100, and I'm amazed their pretty belts are just going at SGD 19.90 a piece! Do you like this #selfie shot? I adore pretty dresses, but I've to admit some of the designs at Glitter Glam are too flowery and complicated for me. Then again, they're perfect for mothers who love to wear matching pieces with their kids. The colourful patterns are great for these mother and daughter teams! 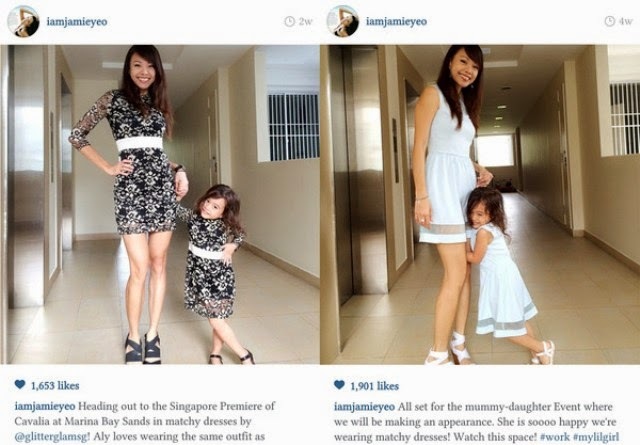 Check out Celebrity Radio DJ Jamie Yeo and her daughter, Aly, turning heads around in their matchy matchy mother-daughter outfits! Mary Had A Little Lamb was conceived on Mothers’ Day 2013 with the brilliant idea of shrinking a mummy’s wardrobe into a mini-me version for her little one. Their first ever collection was the mother-and-child outfits. Going on from here, Mary Had A Little Lamb wishes to produce unique and modernistic outfits for your toddlers and pre-schoolers, bringing you pride and joy. Check out Glitter Glam Mum and Kids Fashion High Tea at Treehouse Cafe, where you'll get to see mothers and their darlings strutting down the catwalk! Good news! Collaborating with Glitter Glam, Luxury Haven is delighted to bring to you an exclusive online promotion just for you! Quote "Lux30off" to get SGD 30 off when you spend SGD 99 and above at their online shop on regular-priced items! 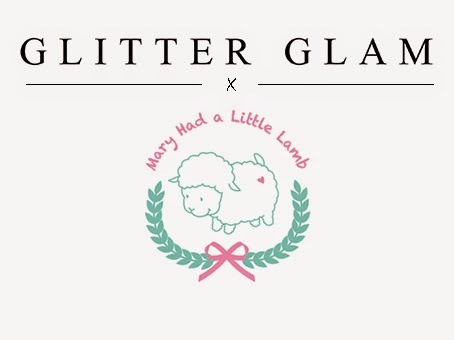 Glitter Glam delivers to Singapore and Malaysia. For International shoppers, do contact them directly at ordersglitterglam@gmail.com for the items you want and they will assist you from there! HAPPY SHOPPING! Thank you, Glitter Glam! I hope I did justice to your dazzling fashion pieces, and that you'll like the #OOTD shots as much as I adore your outfits! LBD I sure agree is a must in our wardrobe. Going over to see more on the site. You look ravishing in these images. Double Tree great place to stay. Jackie, that certainly make my day! Thanks, hun! Helena, thanks for all your support! You rock! DS, you've such fantastic memory! Yes, the metallic dress was a popular vote in FB! Hahaha! Oh, you like the gold/black too? Have fun shopping at Glitter Glam! Maggie, appreciate the lovely thoughts! Lena, pet lovers will love that doggie top! Heehee! All these dresses are so pretty on you Shirley! It's nice to know that they are also affordable. Nicole, I've to admit some of their cutting fits me well & brings out my figure. Hahaha! Thanks, sweetie! Elisa, I'm glad you've found it informative! Jo, thanks for sharing your lovely thoughts! It's great having you here, dear! Elena, it was awesome! Love everything in the post! Hahaha! Dania, I'm glad you like it too! Miharu, thanks for all your lovely thoughts! Have a great day, sweetie! Love this post and your otfits! Crisis, thanks sweetie! Have a wonderful week! You did a marvelous job showcasing their stylish clothes and accessories. I loved the tour! Oh cute dresses. My favourite is the metallic tweed dress!! Diana, that seems to be such a popular vote! 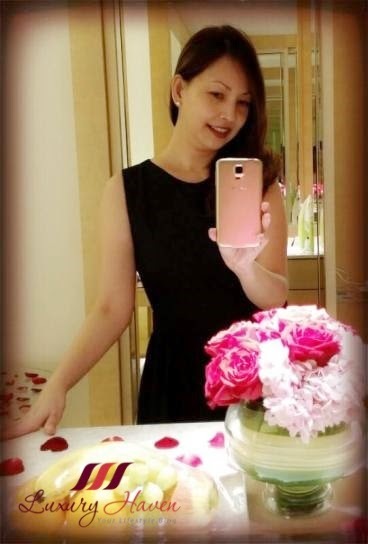 Lovely dresses and your photos are wonderful, Shirley. You are very photogenic. You are stunning in Glitter Glam. I like that gold corded lace dress. Rose, thanks so much for sharing your thoughts! Sharon, you're such a doll! Always love having you here, sweetie! Emily, cool! Hope you'll have fun shopping with them too! Glenda, glad this caught your attention too! Thanks, sweetie! Rae, have a great weekend! Gabrielle, you're such a doll! Always appreciate your sweet notes! Lovely pictures, Shirley! You look so pretty. The puppy printed top is gorgeous. Happy wedding anniversary! You look chic, elegant and sophisticated in all your outfits. You are really beautiful. What a gorgeous place to stay. 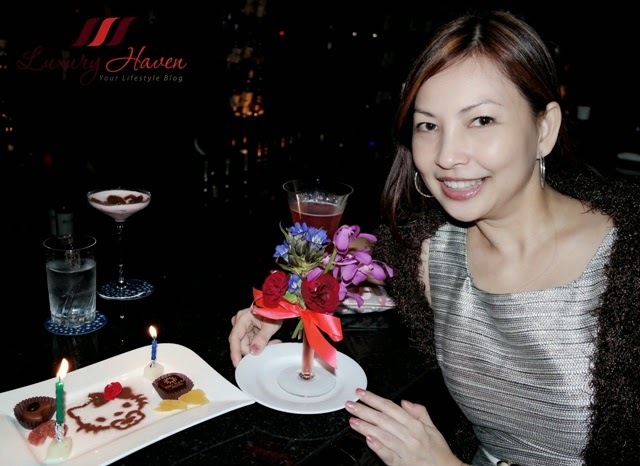 Congrats on the wedding anniversary and happy belated birthday to you and many many happy returns. Anja, I'm real happy with my picks from #glitterglam! Tania, thanks so much for coming by & I'm hopping over to your blog now! I love how classic and transcendent their pieces are on you. And those swan towels! Wow, I didn't realise they still make those and leave them on beds in hotel rooms. I thought it was an 80's trend or just a thing in movies lol! I remember the glitter glam event that I have seen at your blog... You looks great in their outfits too. I wish that I can celebrate my birthday with HK too :p Lucky you! Zoe, you've a fantastic memory indeed! Thank you, sweetie! Liz, thanks hun! Glad you like my selection of outfits! Online shopping is the rage now. Thanks for sharing. Mun, have fun checking them out! You have a very stunning dressing sense, I love the gold lace dress. Subha, thanks for your sweet note! Happy weekend, dear! The dresses looked glamorous and nice. You actually look good in anything you wear. I think the weather in Malaysia is slightly cooler than Singapore on most days, depending on the locations as there are lots of thick jungles here. Your island is definitely cleaner and neat in many folds! I love Singapore! Tan, it's so nice to have another guy checking out my fashion post! I've been to Malacca & Penang, & these places are terribly hot; the heat burns! Hahaha! Carmen, thanks for coming by & I'm popping over to your blog now!